No, this isn’t satire from The Onion. Jay Carney actually said this today. When I first heard about it a few minutes ago I optimistically assumed it meant Obama had changed his mind and that his administration had an unexpected, though welcome, burst of sanity. Sadly, I was wrong. According to Carney, Obama never did turn the Keystone Pipeline down. It was really the Republicans who did. All the fanfare we saw in January when Obama turned it down was just a figment of our imaginations. The reality, according to Carney, is that Obama wanted to go forward with the project but was thwarted in his efforts to do so because Republicans insisted he go forward with the project. Those Wascally Wepublicans, you see, “forced” Obama to turn down the project even though his spokesman now avers he didn’t actually turn it down. Get it? 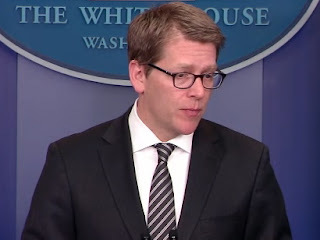 White House press secretary Jay Carney first says Republicans “forced” President Obama to deny the permit for the Keystone XL pipeline. Later in his press briefing, Carney says Obama didn’t turn down the pipeline. “In terms of Keystone, as you all know, the history here is pretty clear. And the fact is because Republicans decided to play political with Keystone, their action essentially forced the administration to deny the permit process because they insisted on a time frame in which it was impossible to completely approve the pipeline,” Carney said when asked about the pipeline by ABC News’ Jake Tapper. Carney: “But the President didn’t turn down the Keystone pipeline”. And there you have it. When we start seeing that $4 and $5 per gallon gasoline this spring, it will obviously be the Republicans fault. Natch. Click the image below to watch. The key exchange comes at about the 4:30 mark.